Being a born and raised ‘Bama’ gal I was impressed to find out a University of Alabama guy has stepped into the scene on 30A. Local Catch is located in Blue Mountain on 30A just a short drive from Destin. It is a local’s favorite for good food, live music and of course happy hour that begins each day at 3pm. 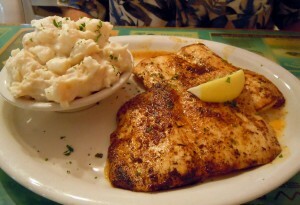 The atmosphere is casual the food is fresh local cuisine with a southern twist. One of the most popular menu items is the pulled pork nachos. Being from the south everyone knows pulled pork is a staple! Other popular items include the fresh Gulf shrimp and fish tacos. Don’t forget the house special – grilled hamburger topped bacon, lettuce and tomato served on a pretzel bun. Big game on tonight? There are televisions throughout the restaurant so you won’t miss a play! With plenty food and drink specials you will definitely want to plan a visit (or two).